I’ve tried several single NYX eyeshadows before, but the Wicked Dreams palette is my first venture into some of their palettes. For the price of this palette, I was pleasantly surprised to find the eyeshadows of good quality. There is a mixture of shimmers and mattes in this palette; some shades are chalkier than others and some do prove to be troublesome to work with. However, for the price, it’s pretty darn good. This is one palette I feel works well for a variety of skin tones due to the vast array of shades you get; everyone can find a good blender in here. 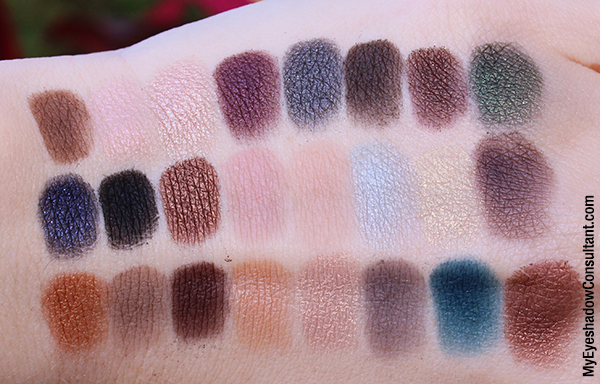 The blending shade that matched my skintone in this palette worked well in blending out the lighter shades, but not so much with the darker shades. It was too sheer to be able to blend out darker crease colors on its own. Some of you with medium to darker complexions may have better luck with your blending shades in this palette than I did. 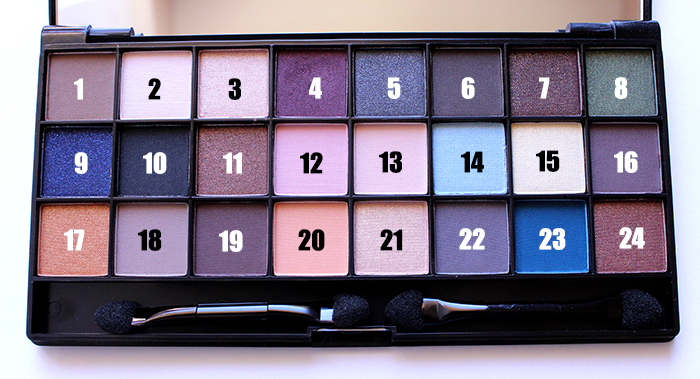 Unfortunately, the eyeshadows in this palette are not named or numbered, so to follow the below combinations, please refer to the diagrammed chart below. Overall, I’d say if you’re new to makeup and starting to learn eyeshadow, or trying to stick to a budget , this is a great little palette. Z…these look like they can be duped with the Naked 1 and 2 palettes. Am I right? These are such beautiful looks! I love, love, love the way 17 comes out in the first look. Some of the shades look absolutely stunning swatched on your hand, Zabrena…#8, 9, 21, 22, 23, especially. I don’t know if this palette is even available here (I was recently looking at the “French” themed ones and would have got one but the reviews were “iffy” at best) but if I see it, I might just be tempted to pick it up. I’d say skip it, honestly! The eyeshadow quality is not up there with the ones you and I are accustomed to. It’s good for the price, but not great. I personally wouldn’t reach for this palette on my own, over other palettes I have. Just my $0.02! As soon as I saw these looks I went to Ulta. (totally helped that they were on sale plus I had a coupon.) Thanks for helping feed beast. The possibilities seem pretty much endless with this one. Haha! This is one I will be updating in the future! Like you say, SO many possibilities! 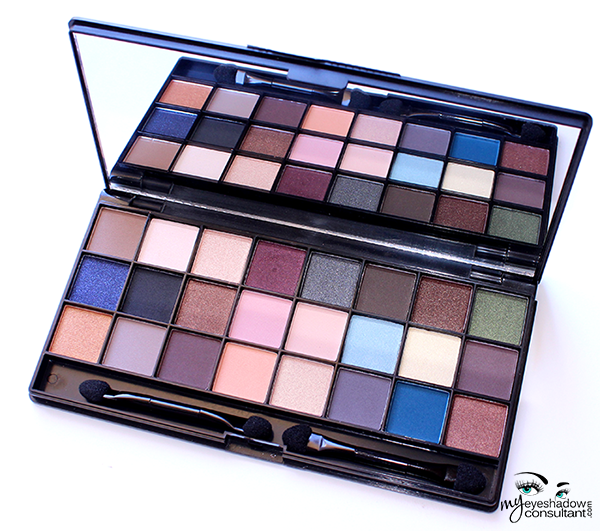 Have you tried the Love in Paris line of palettes from NYX? If not can you do a combos post on here or a review on your YouTube channel please? I’ll be forever grateful! !